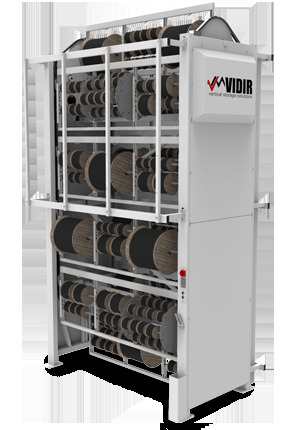 Vidirs Wire Carousel is a motorized wire storage system designed to store, retrieve, and dispense various ranges of wire, cable, rope, chain, and other materials stored in reels or spools vertically which effectively utilizes overhead storage space. This spool carousel is an extremely flexible wire storage solution featuring a fully adjustable interior to accommodate changing inventory. The motorized Wire Carousel increases an organizations effective storage capacity by integrating overhead space into the rooms useable storage space. This is accomplished by automating storage which turns hard to reach storage locations into easily accessible locations allowing inventory to move in and out without difficulty. Vidirs carousel features carriers with interchangeable positions to allow for full space utilization in applications that feature high product turnover. Vidirs Wire Storage System features an assortment of cut/measure/re-roll attachments that may be placed in front of the wire carousel or attached to the face of the carousel to facilitate processing directly from the spool carousel itself eliminating material handling requirements found in more conventional wire storage racks. The mechanical nature of this wire storage system enables spooled product near the ceiling to be retrieved at ground level by the push of a button eliminating the need for ladders, cherry pickers, and other hazardous retrieval methods. Additionally, by presenting product at an ergonomically acceptable height, the Wire Carousel reduces unnecessary bending, walking, lifting, and pushing which helps avoid workplace injuries. 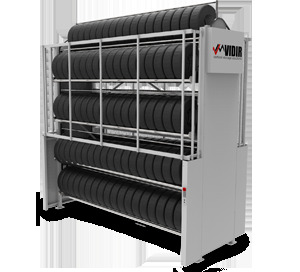 Vidirs Tire Carousel is the ultimate tire storage solution for organizing, storing, displaying and accessing tires efficiently and ergonomically. The Tire Carousel is a semi-automated Vertical Carousel that consists of tire carriers that rotate up and down to deliver tires to the operator at an ergonomic height eliminating the need for ladders, forklifts, and other hazardous retrieval methods. Implementation of the product to person principle eliminates wasteful and harmful steps for stocking and retrieving tires. The Tire Carousel delivers tires directly to the operator eliminating the need for otherwise hazardous retrieval techniques such as ladders and forklifts. Additional benefits are realized from ergonomic access points resulting in a reduction in employee back strain and a reduced physical requirement to handle heavy and bulky tires. 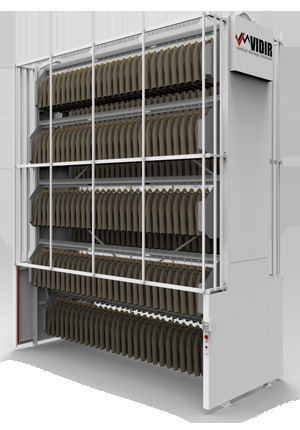 Vidirs Garment Carousel is a motorized vertical carousel designed for high density storage and highly efficient retrieval for garments. The motorized clothing carousel is designed to effectively accommodate a wide variety of garment such as suits, coats, shirts, trousers, and gowns. This automated storage system utilizes the vertical space in retail stores, warehouses, and distribution centers to maximize the cubic footprint while simplifying inventory management. The Garment Carousel maximizes storage density by effectively utilizing overhead space for garment storage. This is accomplished by applying proven vertical carousel technology to achieve unparalleled garment storage within the allotted footprint. Vidirs Garment Carousel can be equipped with our inventory control solutions which greatly reduce retrieval times and picking accuracy. The system consists of our inventory software solution, a sophisticated touch screen controller, bar code scanning, and a pic-to-zone system. This carousel add on is ideal for large warehouses and can greatly help with order picking and fulfillment, product identification, reporting, real time inventory counts, and multi-carousel support. This clothing carousel eliminates wasteful and harmful steps for stocking and retrieving clothes. Vidirs Garment Carousel ensures that operators are working at ergonomically acceptable heights and reduce unnecessary bending, walking, lifting and pushing which helps avoiding work related injuries.